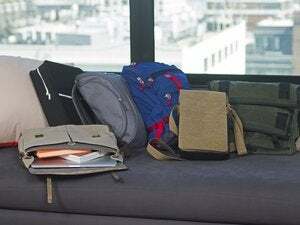 For its lineup of Spring 2011 bags, Incase introduced a new material dubbed “coated canvas.” I spent some time with the company’s Coated Canvas Backpack, the latest incarnation of Incase's standard backpack for any MacBook model. The bag’s unique material caught my attention first. It’s a heavy-duty cotton canvas that Incase has finished with a weather-resistant, metallic-brown coating. The color makes the bag look like a delicious, wearable chocolate sculpture; the overall design evokes a canvas that’s been painted almost entirely with a single color, as if Incase wrapped a Rothko painting around one of its streamlined bags. The material feels slightly more flexible than Incase's usual ballistic nylon, but not anywhere near the point of collapsing into itself like the Osprey Flare. Inside the Backpack you’ll find two separate compartments. The front compartment (the one farthest from your back) houses a few accessory pockets, but not enough—only a handful along one side. One of these accessory pockets fits my laptop's power adapter, another fits my Mophie Juice Pack Air (an iPhone battery case), and a couple of smaller pockets hold pens, thumb drives, and miscellaneous trinkets. There are also two larger pockets, but this compartment is short on places to put essentials such as cables—for example, I ended up putting my USB dock-connector cable loose in the lone zippered pocket on the outside of the bag. I can’t help but wonder if Incase’s penchant for minimalism is getting the best of it here. The large main (laptop) compartment contains a built-in, quilted, rip-stop sleeve that serves as the cushy mobile home for a laptop as large as a 17-inch MacBook Pro. Incase never skimps on padding, so the sleeve offers plenty of protection. Despite accommodating a 17-inch MacBook Pro, I found the Backpack's sleeve to fit a 15-inch, and even a 13-inch, laptop fairly well, although an 11-inch MacBook Air does swim around. The rest of the compartment is big enough to hold a few books and magazines with room left at the top to stash a thin, rolled-up hoodie or rain poncho. For bonus points, Incase recently started adding, to all the company's bags, an iPad-sized slip pocket on the front of the laptop sleeve. Unfortunately, this slip pocket doesn’t offer anything in the way of padding, so if you’re cramming the Backpack full, or if your books are on the heavy side, I don’t recommend squishing an iPad under all that potential weight. Speaking of weight, I found the Backpack to be refreshingly comfortable, even when I stuffed it to the brim. To put the bag through its paces, I tossed in my MacBook Pro as well as a couple of heavy design books and a hoodie. Thanks to well-padded straps and a nice back pad, I had no trouble commuting between Chicago coffee shops all day. At times the bag almost felt too light on my back, as if I had forgotten something along the way. Ultimately, the Coated Canvas Backpack is a good bag that breaks away from the Ubiquitous Nylon Design found in so many laptop backpacks these days. The unique material looks and feels interesting, and extra weatherproofing is rarely a bad thing. The bag is a little short on pockets for my tastes, but if you aren’t an obsessive compartmentalizer like I am, this bag has plenty of space to carry everything you need in a comfortable, thoughtfully designed, and stylish package.